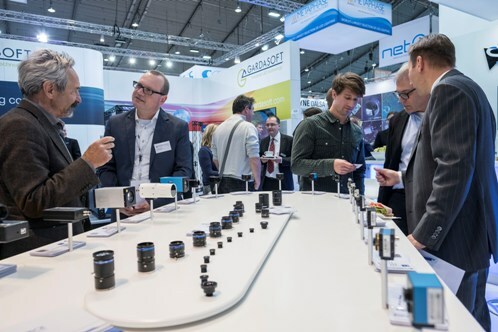 The Vision trade fair in Stuttgart, arguably the largest gathering in the machine vision industry’s calendar, certainly in Europe, had lots to say about future directions the market could take, as well as some more current technology trends. Industry 4.0 and embedded vision (for more on embedded vision from the show, see: Embedded vision to transform industrial imaging?) were two very much future oriented trends discussed at the show, held from 8 to 10 November. Dr Olaf Munkelt, managing director of MVTec Software and chairman of the board of VDMA Machine Vision, told Imaging and Machine Vision Europe that it is likely to be 10 years before the vision market and most factories start to operate in line with Industry 4.0. The idea behind Industry 4.0 is that factory processes will be better connected, with exchange of data and information at all levels within the organisation. Data analysis will help govern production, and manufacturing plants will become more flexible to cope with greater variety in products. Dr Klaus-Henning Noffz, CEO of Silicon Software, commented at Vision 2016 that Industry 4.0 will mean the market for machine vision will be bigger, but that customers will demand products that can scale to larger volumes, a challenge for small companies such as those found in the machine vision sector. He said the key for success of machine vision in Industry 4.0 will be standardisation. VDMA Machine Vision is working with the OPC Foundation to prepare a companion specification for vision for the OPC Unified Architecture (UA) standard. Noffz said that the working group is aiming to make the specification available next year. Bosch was one company exhibiting at Vision that had solutions for smart manufacturing – it was showing its Apas Inspector solution, a robotic system designed to work alongside humans to give a more flexible approach to production. As a relatively niche market, machine vision is heavily influenced by the consumer sector, no more so than for the image sensor technology used. Most industrial cameras are now based on CMOS sensors as opposed to CCDs thanks to mobile phone cameras predominantly using CMOS, although Michael DeLuca, market manager for On Semiconductor’s industrial and security division, commented at the trade fair that ‘there is still a place for CCDs’. 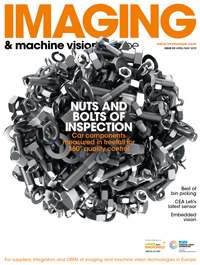 Henning Tiarks, director of marketing at camera maker Basler, told Imaging and Machine Vision Europe that Basler estimates 60 per cent of industrial cameras use CMOS sensors at the moment, and within two to three years he put that figure at up to 90 per cent. Tiarks said that the huge increase in the use of CMOS technology coupled with industrial imaging being a fairly niche market means that the supply of these sensors can sometimes be limited – he gave the example of the earthquake in Japan in the summer disrupting Sony’s CMOS fabrication lines, which in turn impacted camera manufacturers. On Semiconductor was showing a wide range of CMOS and CCD sensors, including its high dynamic range interline transfer EMCCD, which switches from an EMCCD in low light levels to a CMOS sensor once the light intensity threatens to flood the EMCCD with charge. DeLuca noted during the show that automotive driver assistance systems is a big market for On Semiconductor. Other sensor technology was on display at the show, from Cmosis, recently acquired by AMS, which launched a 48 megapixel global shutter CMOS sensor supporting 8k image resolution at 30fps, and Sofradir, which introduced a 300fps SWIR sensor, the Snake, that the company was targeting at machine vision applications. Among these were sensors from Chronocam and Leti, both of which have developed technology with unique characteristics. Chronocam’s CMOS sensors emulate biological vision by reacting to what is happening in the scene and acquiring only the necessary information, rather than taking snapshots of the entire scene at fixed points. In this way, they are able to reach speeds of 100,000 frames per second, a dynamic range of up to 140dB, and video compression of 10 times to 1,000 times. The technology won best start-up at the investment conference Inpho Venture Summit in October. Groupe Renault has since entered into a strategic development agreement with Chronocam to apply the sensing approach to Renault’s Advanced Driver Assistance Systems (ADAS) and autonomous driving developments. Meanwhile, Leti was introducing technology that can lower image sensor readout noise down to 0.5 electron noise. Named Owly-eyed, the technology is based on the electrical architecture of a pixel readout that can be integrated directly into image sensors. It is able to achieve a sub-0.5 e−rms temporal read noise on a VGA-format CMOS sensor implemented in a standard CMOS process. Spectral imaging was popular at the show, and image fusion, where different image feeds are combined to give more information, was also on display. A wealth of 3D vision technologies was also shown, from time-of-flight to stereovision. The European machine vision industry is expected to grow eight per cent in 2016, according to the latest figures from the VDMA Machine Vision, while statistics from the AIA sees the North American market shrinking by one per cent in 2016, due to a poor start to the year. The trade fair attracted almost 10,000 visitors over the three days from 58 countries.